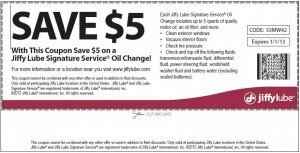 Jiffy Lube is one of the most well know, respected, and frequented oil change centers in the United States. Chances are, you may have had at least one oil change performed by their skilled mechanics through out the years. You probably also noticed that Jiffy Lube usually has some discounts and coupons available to all customers. They advertise heavily on the internet and also in weekly circulars. This one deal is good through the entire 2012 year. From now until January 1, 2013 you can get $5 off of your Jiffy Lube Signature Oil Changes. One great thing about this oil change coupon is that you can come back any time this year to use it. Just print out the coupon and bring it to Jiffy Lube for all of your 2012 oil changes to save $5. When you come in for this cheap oil change, you can expect up to 5 quarts of motor oil and an oil filter change. You’ll also have your exterior windows cleaned, interior floors vacuumed, tire pressure checked, and have most of your fluids checked and topped off. This is a pretty good deal from Jiffy Lube.